Vitamin D, also known as the “sunshine vitamin”, is naturally produced in our skin by exposure to sunlight. However, people living in places like Canada, where sunlight is not strong enough to stimulate the production of Vitamin D during September to May, they are at high risk of developing a Vitamin D deficiency. 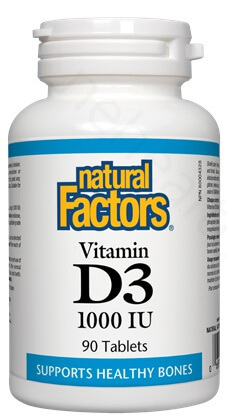 Therefore, Natural Factors Vitamin D is all they need. New research shows that Vitamin D play an important role in supporting and enhancing our cardiovascular health, bone development, nervous and immune system. One recent study also finds that people who took Vitamin D supplements on a daily basis had a 7% less risk of death than those who did not take any at all. 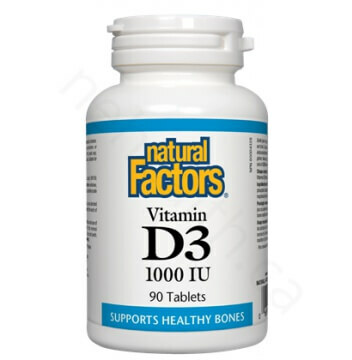 What Are the Key Health Benefits Associated with Natural Factors Vitamin D3? Aids in the absorption of calcium and phosphorus. How does Vitamin D work in our body? Vitamin D is synthesized when sunlight converts cholesterol in your skin into a form of vitamin D3 called calciol. Then the liver hydroxylates calciol into a form called calcidiol (25-hydro-xyvitamin D3). Finally, the kidneys hydroxylate calcidiol into the active form of vitamin D called calcitriol (1,25-dihydroxy-vitamin D3). Calcitriol, which is also a hormone in our body, acts as a regulator for cellular production of essentials amino acids and enzymes. Non-medicinal ingredients: Microcrystalline cellulose , dicalcium phosphate dihydrate , vegetable grade magnesium stearate (lubricant). Adult dosage: 1 tablet daily or as directed by a health care practitioner. Pregnancy and lactation: Suitable for pregnant and lactating women. Drug interactions: Many drugs cause vitamin D deficiencies because they interfere with the absorption and/or metabolism of vitamin D, including cholestyramine (Questran), colestipol (Colestid), phenytoin (Dilantin), phenobarbital, orlistat (Xenical), and mineral oil. Also, corticosteroids, such as prednisone, increase the need for vitamin D.
consult a health care practitioner before supplementing with vitamin D. People with liver or kidney disease, primary hyperthyroidism, lymphoma, tuberculosis and granulomatous diseases should consult a health care practitioner before supplementing with vitamin D.
Chapuy, Marie C., et al. 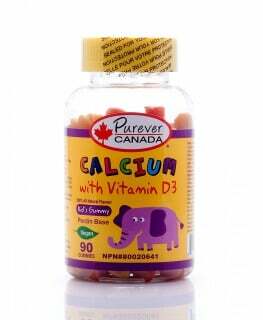 "Vitamin D3 and calcium to prevent hip fractures in elderly women." New England journal of medicine 327.23 (1992): 1637-1642. Trivedi, Daksha P., Richard Doll, and Kay Tee Khaw. "Effect Of Four Monthly Oral Vitamin D₃ (Cholecalciferol) Supplementation On Fractures And Mortality In Men And Women Living In The Community: Randomised Double Blind Controlled Trial." BMJ: British Medical Journal (2003): 469-472. Wang, Thomas J., et al. "Vitamin D deficiency and risk of cardiovascular disease." Circulation 117.4 (2008): 503-511.